Stephen Rubin - who owns a majority stake in JD Sports - and his family are the UK's top taxpayers, according to the Sunday Times. The newspaper is known for its rich list of the UK's wealthiest people - but has now, for the first time, drawn up a list ranking tax contributions. It estimated the tax due on business profits, share sales, dividends, house purchases and personal income. 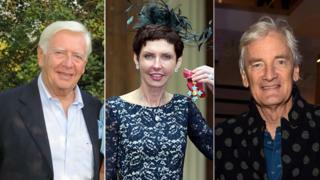 Denise Coates, the Bet365 boss, and Sir James Dyson also make the top three. As the largest taxpayers, Mr Rubin and his family will pay an estimated £181.6m in tax for the 2017/18 financial year - which works out at nearly £500,000 a day. This includes £121.6m from his stake in JD Sports as well as £53.2m in corporation tax owed by the family's company, Pentland Group, and £6.9m on the dividends they were due. Pentland Group employs more than 41,000 people and owns sports and fashion brands including Speedo, Ellesse and Berghaus. Just two of the top taxpayers also appear in the top 10 of the paper's Rich List - which is based on their overall wealth. The tax calculations are based on income. Who are the UK's largest taxpayers? Stephen Rubin and family, £181.6m. Majority stakeholder in JD Sports and owner of Pentland Group. Denise, John and Peter Coates, £156m. Owners of gambling company Bet365. Sir James Dyson and family, £127.8m. Vacuum cleaner and household appliance company. Bruno Schroder and family, £114.3m. Investment management company. Sir Jim Ratcliffe, £110.5m. Owner of Ineos chemicals company - No 1 on Sunday Times Rich List 2018. The Weston family, £76m. Owners of brands including Selfridges, Primark, Ryvita, Silver Spoon, Ovaltine and Twinings - No 9 on Sunday Times Rich List 2018. Sir Chris Hohn, £64.8m. Manager of TCI hedge fund. Sir Peter Wood, £53.7m. Founder of esure insurance company. James Benamor, £52.2m. Owner of Amigo Loans and Richmond Group moneylenders. Baroness Howard de Walden and family, £44.1m. Property investors. Denise Coates - the billionaire businesswoman and driving force behind online gambling company Bet365 - was ranked the second largest taxpayer, alongside her brother, John (joint chief executive) and father, Peter, (chairman). They paid at least £156m in tax last year, the newspaper estimates, mainly as a result of Ms Coates' high salary - believed to be the UK's highest - which incurred £99m in tax. Meanwhile, Sir James Dyson and his family - whose household appliance company announced last week it was relocating its head office to Singapore - are ranked third on the list, with tax liabilities estimated at £127.8m. His company paid £95m in UK tax in 2017, and the family were liable to pay tax of £32.8m on the dividends. Also on the list are the owner of Home Bargains, Tom Morris and his family (£39.2m); Sports Direct owner Mike Ashley (£30.4m); bakers the Warburton family (£14.5m); and David and Victoria Beckham in 49th place (£12.7m). The wealthy are often accused of not paying enough in tax. This ranking celebrates those who contribute the most to the Exchequer, not those who have simply earned the most within a year. This list details some of the large UK tax contributions being made by the leaders of some of our most well-known businesses. An individual's tax affairs are private in the UK. The Sunday Times Tax List is based on publicly available documents, so it isn't the full picture. The newspaper says its estimate of tax bills is likely to be conservative. Remember, it is income that's taxed, not wealth. Perhaps that's why only 28 out of the 145 billionaires on the same newspaper's Rich List appear on the, admittedly much shorter, Tax List. The Panama Papers and Paradise Papers - a leak of confidential documents revealing how the wealthy use tax havens - has led to a heightened interest in tax affairs. According to the Sunday Times, the 50 entries paid nearly £2bn in UK tax last year. The newspaper said that, when calculating tax liability, it did not include tax paid overseas in its calculations. It added that just 28 of the 145 billionaires and 18 of the 855 millionaires on last year's Sunday Times Rich List are featured in the tax list. Income Tax: Paid at 45% on earnings above £150,000.